of the ones we love so dear. 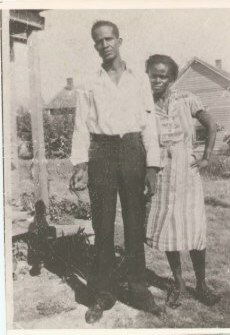 We are the descendants of Amos Matthews (1903-1976) and Bertha Mae Shaw Matthews (1905-1986). Amos Matthews was born in Hill's Prairie (Bastrop area), Texas on February 28, 1903 to the parentage of Wiley Matthews and Ida Williams Matthews. Bertha Shaw was born in Itasca, Texas on April 28, 1905 to the parentage of Henry Shaw and Callie Anderson Shaw. 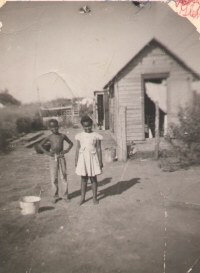 Amos and Bertha were married in 1933 during the height of the Depression. This was the second marriage for both. 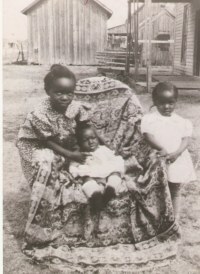 From those previous marriages, Amos had two sons and Bertha had two daughters. When they married, they blended a "Brady Bunch" sort of family. After they were married, Amos and Bertha's love produced six sons. With all of these ten children in & around the house, Amos and Bertha still found food enough to feed several neighboring families. Amos had livestock in a vacant lot behind his home and when he slaughtered a hog or cow, everyone in the community had meat for their families. Bertha had chickens that produced meat and eggs for her family and neighbors too. This was "back in the day" when you loved your neighbor and people took care of each other. 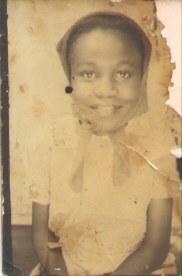 Bertha loved to sing in the church choir at Bethel African Methodist Episcopal Church and played piano very well. She traveled annually to Los Angeles to visit relatives and friends. She was a delightful blessing to all who knew her. Amos was a hard-working railroad employee who retired both from the railroad and then from A. Brant Furniture Company of Fort Worth, Texas. Even after those two retirements, he continued to work around his home and kept the most beautiful Saint Augustine grassed yard in the city of Itasca until his death in 1976. Daddy Amos and Mama Bertha are loved, missed and still spoken fondly of by the citizens of our community in Itasca, Texas. This website is a labor of love in their honor. I have listed Amos and Bertha's ten children in the order of their birth. They are all unique individuals who have their places in the family hierarchy. You may visit their individual pages by clicking on the links below or browse all pages using the directional arrows at the left. Chorus: We are family. I've got all my sisters with me. We are family. Get up everybody and sing. We are family. Get up everybody and sing! 1. Everyone can see we're together as we walk on by. And we fly just like birds of a feather, I will tell no lie. All of the people around us they say: "Can they be that close?" Just let me state for the record - "We're giving love in a Family Dose"
2. Living life is fun and we've just begun to get our share of this world's delights. High hopes we have for the future and our goal's in sight. "Have faith in you and the things you do, you won't go wrong." This is our Family Jewel.